Please use the drop-down menu to select your preferred size/colour. For best results, clean all surfaces to be free of algae etc. Pump sealer onto surface to be bonded. Can be used on wet or dry surfaces and will cure underwater. Do not use in temperatures below 10 degrees c.
For strongest bond, pipe minimum 10mm wide bead around patch and press lightly onto repair area. is livestock near the sealer, protect from ingestion while curing. 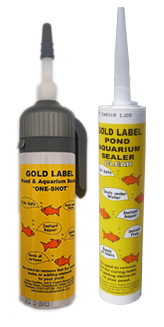 The 'Silver Label' aquarium sealant is solvent free, non toxic and safe for fish once fully cured. It will adhere to dry, clean and grease free glass and will be fully cured after 24 hours. We sell it in both black and clear colour varieties and provide it in a 310ml tube for use with a trigger gun. Solvent Free and can bond to Glass. Black & Clear colour varieties. Full curing time of 36 hours. For optimum structural strength use a triangular joint shape and avoid thin layers.